Spaghetti Squash Chicken Parmesan - PhenomNomz! An amazingly healthier version of everyone’s favorite chicken parm without compromising taste. The best comfort food! I’m getting ready for my summer bod. We’re subbing out the pasta. And using spaghetti squash instead. I’m kind of a genius. Cut the squash in half lengthwise from stem to tail and scrape out the seeds. Drizzle with olive oil and season with salt and pepper, to taste. In a large bowl, combine breadcrumbs and Parmesan; set aside. Working one at a time, dredge chicken in flour, dip into eggs, then dredge in breadcrumbs mixture, pressing to coat. Add chicken to the skillet and cook until evenly golden and crispy, about 3-4 minutes. Transfer to a paper towel-lined plate. Let cool before dicing into bite-size pieces. Preheat oven to broil. Lightly oil a large oven-proof skillet or baking dish or coat with nonstick spray. Add spaghetti squash to the prepared skillet or baking dish and layer with chicken and tomato sauce; sprinkle with cheese. Place into oven and cook until melted and golden brown, about 2 minutes. 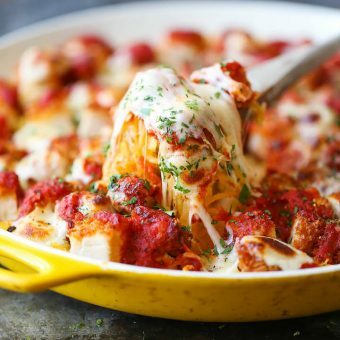 The post Spaghetti Squash Chicken Parmesan appeared first on Damn Delicious.